Sevilla condos in Las Vegas real estate announced Wednesday pricing specials such as same day Sevilla condo move-ins and TiVo’s to the first 10 Las Vegas condominium home buyers. In addition, Sevilla Las Vegas real estate will give away a one-carat Tiffany-style diamond from Ilan Portugali Diamond Importers, according to sales agent Amy Stuart. The TiVo and pricing promotions will continue throughout the weekend. Sevilla Las Vegas condos clubhouse amenities include a pool, spa, health-center and barbecue areas. Two Las vegas condo floor plans include the Valencia Plan and Barcelon Plan. The Valencia Plan home floor plan measures 689 square feet, and contains one bedroom and one bath. Loretto Bay by Pageantry Las Vegas homes are located in Henderson real estate and the official grand opening is on Sept. 29. Loretto Bay homes are at the intersection of Wigwam Avenue and Stephanie Drive. The Henderson real estate development offers duplex condos, homes and townhomes ranging from 1,139 to 2,381 square feet and prices starting from the low $200,000s. Seven model homes for sale in Las Vegas real estate are available. Loretto Bay Las Vegas is a gated community featuring inspired architecture from Santa Barbara. The community incorporates three distinct neighborhoods in La Tesoro, a Henderson town house community; Villa Azure, a Las Vegas condominium community; and Bella Lago, a single-family attached Henderson real estate. Andre Agassi tennis superstar of Las Vegas joins America Online co-founder Steve Case in developing Exclusive Resorts a worldwide real estate project of multi-million dollar resort homes for luxury travel. Andre Agassi and wife Steffi Graf tennis star will partner with Case’s Exclusive Resorts, luxury residence club, to develop luxury tennis courts and additional resort sites that will add to the company’s 38 worldwide locations. Business Bank Corporate Centre in Summerlin Las Vegas real estate is a new six-story, 150,000 sf office building that is under construction and topped off last week in the Summerlin Centre. 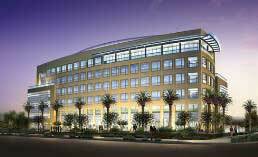 This Summerlin commercial real estate is 70% preleased several months prior to completion. Occupancy is slated for spring 2007. Charleston Pavilion LLC is the real estate developer of the Business Bank center, which is comprised of board members of the Business Bank of Nevada, the anchor tenant. The largest contiguous availability is about 25,000 sf on the third floor. The asking lease rate is $2.60 per sf per month.